SV Windfall - Confortable boat - Exotic places - Unforgettable experience in Panama! Confortable boat - Exotic places - Unforgettable experience in Panama! 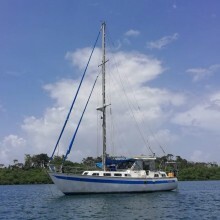 We are a couple on a 42' sailboat looking to share our experiences with new or experienced sailors. We work on Marina business and we have our boat located in the marina during the week and sailing and discovering the archipelago on the weekends. Bocas del Toro has more than 300 islands, most of them untouchable places. Also, you can find a lot of activities in the main island (Colon) like: Night clubs, more than 50 restaurants, world class surf, white sand beaches, snorkeling, scuba diving, fishing hiking, bird watch, bat cave and much more! Bocas its a real hub for the people witch is traveling in the Central America. Lots of sailboats around just in case you need a ride for another place in the world. We offer a cabin for 2 (V berth), storage, private head, comfy saloon and shared galley. During the week we are most part of the time working, so you and our cat Mack gonna have the entire boat for your self. We can plan with you the best weekend trip around the archipelago. $80 per person when sailing in the weekends. *you bring your own food. We can be very flexible with prices and food expenses. If you are looking for good accommodations and some sailing experience this is your chance! Boat descriptionVery solid boat built for open water navigation. 2 cabins, 2 heads, complete galley and very comfortable saloon with TV, DVD, stereo, AC and much more. 85 HP diesel engine, 4.7k diesel generator, 2k gas generator, 9.9HP Yamaha, 13' Aquilles tender, VHF, radar, chart plotter, AIS, depth sounder, snorkel gear, fishing gear and all the safety equipment.